The CYBLE-222005-EVAL board can be used with the Bluetooth Low Energy Pioneer Kit (CY8CKIT-042-BLE) and PSoC Creator to develop BLE applications. To enable easy prototyping the evaluation board routes the GPIOs of the on-board EZ-BLE PRoC Module to the CapSense slider, RGB LED, switches, PSoC 5 LP and FRAM on the BLE Pioneer Baseboard. 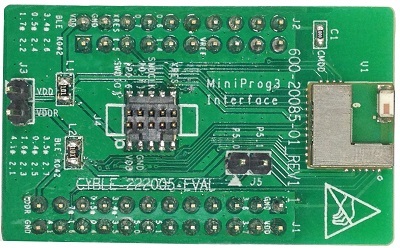 The CYBLE-222005-EVAL board can also be programmed and debugged with the PSoC MiniProg3 Program and Debug Kit (CY8CKIT-002) and PSoC Creator.